Plenty of power for all your gear, including your MacBook Pro. It’s not a bad idea to keep a small battery pack in your backpack or purse at all times. You’d be surprised how often a little extra juice can save the day. But what if you have bigger needs? Laptop-scale needs? What if that 12-hour international flight doesn’t have seat outlets? What if you’re doing a lot of work on your MacBook at an outdoor venue and you have no idea if you’ll have access to a outlet? 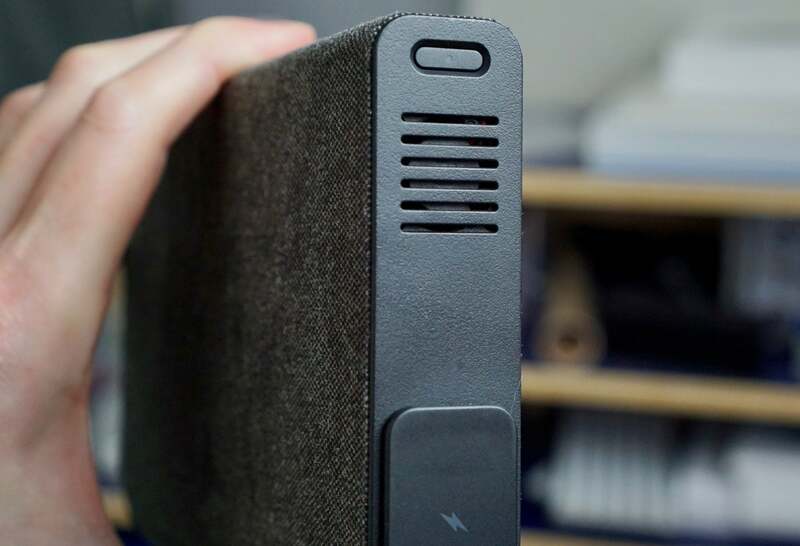 A large power pack with an AC plug, like Mophie’s new Powerstation AC, may be just what you need. The Powerstation AC has a welcoming design. It’s about the size of a small paperback book, but much heavier at about 1.66 pounds. The cloth exterior looks and feels good, and prevents visible scratches while making it easy to grip even with sweaty or dirty hands. 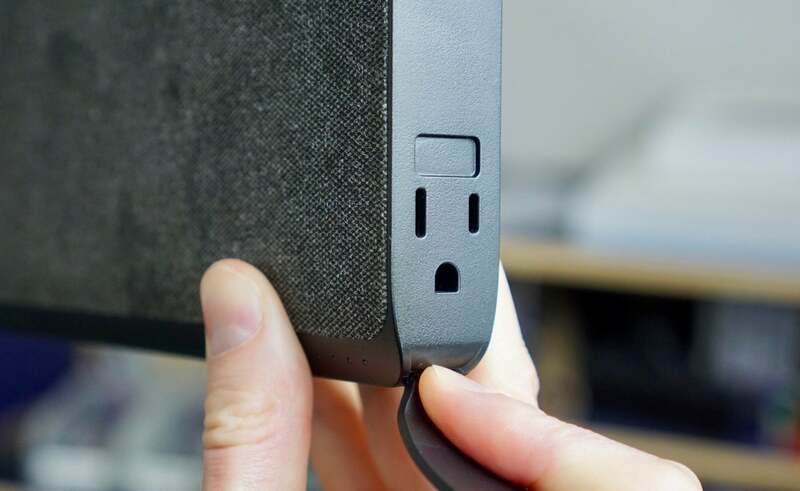 You’ll find only three power ports: one USB-C (used to power devices and also to charge up the Powerstation AC), one USB-A, and a three-prong 110V AC plug hidden behind a rubber flap. The three-prong, GFCI protected AC outlet is locatd under a flap on the side. You’ll find two buttons on the Powerstation AC. One next to a row of four small white LEDs, used to check how much charge the pack has. Another is on the same side as the AC outlet—you have to hold it down for 3 seconds to “activate” the AC outlet before plugging something into it. The Powerstation AC is about the size of a paperback, but probably too heavy to carry with you every day. That last one is the reason this battery pack costs so much more than regular USB packs. You can plug in any device or special charger that requires an AC outlet, as long as it doesn’t draw more than 100 watts. It’s even GFCI protected. So yes, this is a power pack you can plug your MacBook Pro power adapter into—even the 15-inch model. The USB-C port supports USB power delivery up to 30 watts, which is more than enough to fast-charge your new iPhone. If you have a newer MacBook or MacBook Pro that uses USB-C to charge instead of the MagSafe connector, it will charge that, too. It’s a lot slower than the 61W (13-inch MacBook Pro) or 87W (15-inch MacBook Pro) power adapter that came in the box with your laptop, but it will still get the job done. Mophie claims 22,000 mAh of power storage, or about 90 watt-hours. That should be enough to fully recharge a 13-inch MacBook Pro more than 1.5 times, or a 15-inch MacBook Pro once. You could recharge your iPhone X eight times. It’s not the highest capacity we’ve seen in an AC-capable battery pack, but it’s in line with a lot of its competitors. Charging a USB-C MacBook works great, but it uses up the sole USB-C port on the Powerstation AC, which is also used to charge the pack. 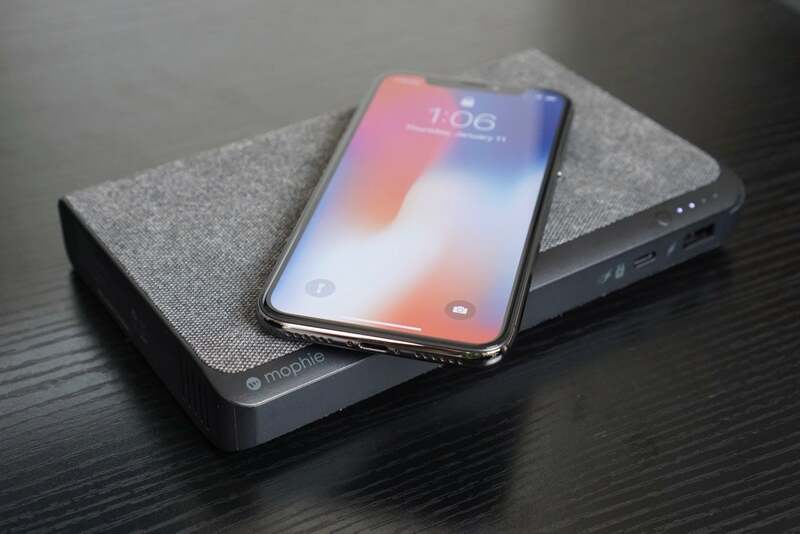 One particularly useful feature is something Mophie has branded “Priority+ charging.” If you have the Powerstation AC plugged into the wall to charge up (via the USB-C port), and you have a phone or tablet plugged into the USB-A port, it will first charge up the connected device before charging up the battery pack. Oh, and you can even charge up the battery pack using your laptop’s USB-C port. 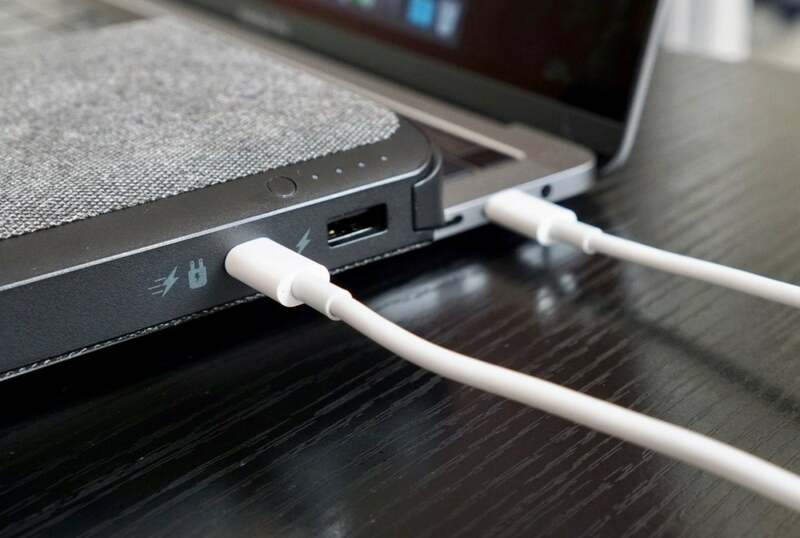 Just make sure your USB-C laptop is plugged into the wall with its own power adapter as well as plugged into the Powerstation AC via a USB-C cable. Then hold down the battery status button for three seconds. Both of these features are useful for a common travel situation: charging a dead power brick and a dead device overnight, so they’re both full and ready to go in the morning. I had no issues getting the Powerstation AC to do any of the things it’s supposed to do. I charged several different laptops with the AC outlet, using their original power adapters. That includes a 13-inch MacBook Pro, a Surface Laptop, and a 4-year old Dell Latitude. I charged iPads and iPhones using the USB-A port, and found it charged them about as fast as the iPad power adapter supplied by Apple. I charged a new 13-inch MacBook Pro with Touch Bar using the USB-C port, and an iPhone X using the same. A small fan on the side spins up when you use the AC outlet, and the noise is quite distracting. The only real annoyance is the loud fan noise when using the AC plug. It's understandable that, when driving such high power output, Mophie has to do something to keep the power circuitry and battery cool. But it really is quite distracting. How fast does it charge your devices? Well, a real answer to that is going to depend on a host of variables (how’s the battery health in your device?). 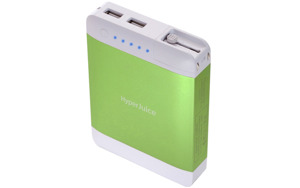 But I kept a close eye on charge rates to get an idea of how much juice it could deliver over one hour. Charge performance is great on all ports. I could even fully charge a 13-inch MacBook Pro in less than two hours with the AC port. My iPhone X, when connected to the USB-A port, went from 10 percent to 65 percent in an hour­—roughly the same performance as the 12W iPad power adapter. When connected to the USB-C port with an Apple USB-C lightning cable, it went from 10 percent to 78 percent in an hour. My 13-inch MacBook Pro with Touch Bar climbed from 7 percent to 57 percent in one hour using USB-C. When I plugged the MacBook Pro’s AC power adapter into the Powerstation AC’s socket, one hour of charging took it from 15 percent to 83 percent. Those numbers are pretty quick, and a lot faster than some of the cheaper battery packs I've used. Fully charging the Powerstation AC with a good USB-C adapter (30 watts or more) takes about 2.5 hours. That’s a relief; I’ve used too many battery packs that take all night to recharge. I have a couple of minor issues with Mophie’s Powerstation AC. It’s a little more expensive than some of its competitors. For example, RAVpower has a similar device with a higher capacity and a second USB-A port for $130, though it annoyingly requires a separate DC power adapter to charge. Mophie has a reputation for quality and reliability, and does indeed appear to be a well-made battery pack. But for the price, I’d like to see another USB-C port, so you can charge the battery while a USB-C device is plugged into it overnight. And a second USB-A would be a good idea, too. Overall, this well-made device does what it says it will. 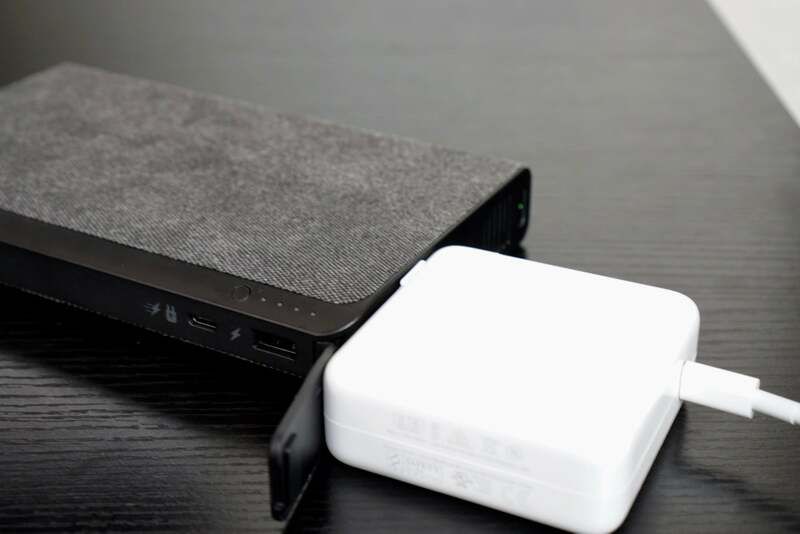 It has enough power to fully charge most laptops (some more than once), and thanks to the AC plug it can power almost anything that draws under 100 watts. It charges iPhones and iPads quickly, and the USB-C port even delivers enough power to charge a newer Mac laptop in just a couple hours.